We join urban explorer Jon Dunbar of Daehanmindecline for a walk through an old neighborhood called Bamgol Village — or what’s left of it. 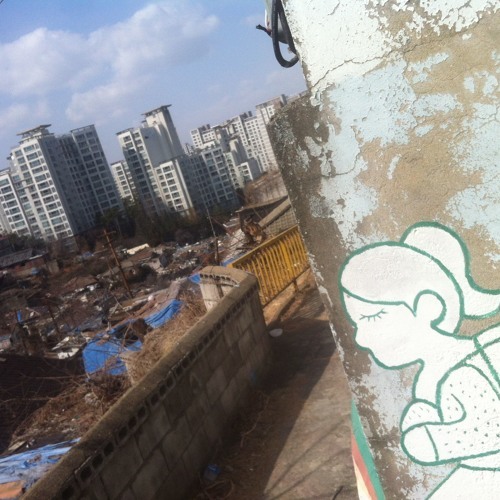 Urban redevelopment never stops in Seoul, and when it happens it scrapes whole communities off the map, usually in order to replace clusters of low-rise buildings with another set of the high-rise tower blocks that have increasingly characterized the city since the 1970s. Bamgol Village’s bid to save itself with by filling its walls with colorful murals didn’t pan out, and as in all such condemned neighborhoods, some residents haven’t had an easy time leaving: amid the heaps of rubble stand half-demolished houses still strewn with possessions, and at least one may even remain occupied.